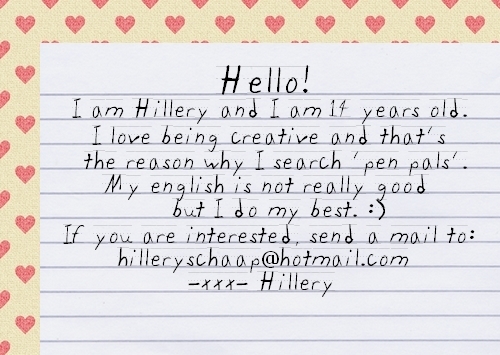 If you'd like to become pen pals with Hillery, leave a comment below with your email address so Hillery can contact you and you can swap addresses. Don't forget to check out other pen pal calls, to get in touch with other people who are looking for a pen pal. Hello Hillery! I don't have a blogspot... I'm a brazilian girl. I'm 19 years old, I am an English teacher and I really would like to send you and other people letters. My name is Laryssa. It will be a pleasure to send a receive different stuff from other countries!